After premiering earlier this year in Santa Barbara, Writer/Producer/Director/Star Emilio Estevez has brought The Public to TIFF. Stuart (Estevez) is a supervisor at the Cincinnati Public Library. One cold evening, homeless Jackson (Michael K. Williams) stages a sit-in with a large number of other homeless patrons. They refuse to leave, and after the doors are barricaded shut, news of the situation quickly reaches the police and local television media – and only becomes bigger from there. Estevez admirably tackles a number of topics and ideas within The Public. But from the very beginning, the Film has trouble honing in on where to properly focus. The sit-in that forms the crux of the Plot does not take place until nearly 45-minutes into two-hour Film, and everything that comes afterwards feels very long and drawn-out. 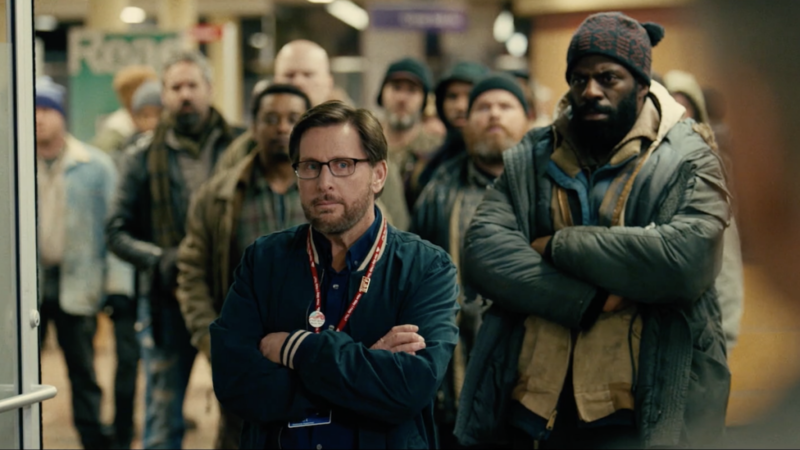 The sprawling Ensemble Cast do the best with what they are given (especially Williams and Christian Slater as a slimy mayoral candidate), but many are cast aside after they serve their characters’ purpose. With some choice edits, The Public could easily become a much stronger Film. The Public screens on Sunday, September 9 at 2:30 PM at Roy Thomson Hall, Monday, September 10 at 10:30AM at Winter Garden Theatre, and Friday, September 14 at 4:15PM at Elgin Theatre.